Characterization, Fe/Mo ordering and magnetic properties of Ca2FexMo2−xO6 (x = 0.9, 1.0, 1.1 and 1.2) (CFMO) double perovskite have been studied. Sonochemical methodology is adopted to synthesize Ca2FexMo2−xO6 double perovskite at low temperature (950 ∘ C) under Ar/H2 atmosphere. Single-phase monoclinic structure by space group P21/n, lattice parameters (a, b and c) and unit cell volume (V ) have been confirmed from X-ray diffraction (XRD) patterns. Average grain sizes of 145 nm with a variation of porosity were observed from scanning electron microscopy (SEM) pictures. Elemental analysis using energy-dispersive X-ray spectroscopy (EDS) confirmed the presence of elements Ca, Fe, Mo and O with no trace of foreign elements, and the compound is found to be pure. Fourier transform infrared spectroscopy (FTIR) data confirmed perovskite formation by identifying three characteristic absorption bands in the wave number range 400–1000 cm− 1 for Mo-O and Fe-O vibrations. 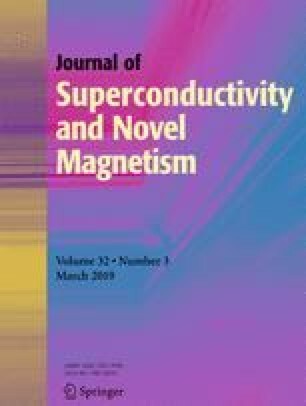 Magnetic properties like Ms, Mr and Hc were studied for CFMO series using vibrating sample magnetometer (VSM). Saturation magnetization is found to vary with Fe composition (x). One of the authors (SVP) wishes to thank the Principal and HOD of the Department of Physics of JNTUACEP for providing the lab facility for synthesis; expresses his gratitude to Prof. G. Bhikshamaiah, Department of Physics, Osmania University, for providing the gas treatment facility; and thank Shri. M. Shiva Kumar (IITK) and Dr. K. Nageswara Rao (Director P&R, DRDL) for their technical inputs and unconditional support as well as Ln. K. Krishna Reddy (Chairman, KGRCET) for the encouragement.